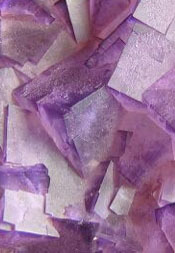 Fluorine is found in nature in the form of calcium fluoride, CaF2, called fluorite, which forms regular crystals. From the Latin and French fluere: flow or flux. In 1529, Georigius Agricola described the use of fluorspar as a flux, and as early as 1670 Schwandhard found that glass was etched when exposed to fluorspar treated with acid. Scheele and many later investigators, including Davy, Gay-Lussac, Lavoisier, and Thenard, experimented with hydrofluoric acid, some experiments ending tragically. The element was finally isolated in 1866 by Moissan after nearly 74 years of continuous effort. Fluorine is the most electronegative and reactive of all elements. It is a pale yellow, corrosive gas, which reacts with most organic and inorganic substances. Finely divided metals, glass, ceramics, carbon, and even water burn in fluorine with a bright flame. Until World War II, there was no commercial production of elemental fluorine. The nuclear bomb project and nuclear energy applications, however, made it necessary to produce large quantities. Fluorine and its compounds are used in producing uranium (from the hexafluoride) and more than 100 commercial fluorochemicals, including many high-temperature plastics. Hydrofluoric acid etches glass of light bulbs. Fluorochlorohydrocarbons are extensively used in air conditioning and refrigeration. The presence of fluorine as a soluble fluoride in drinking water to the extent of 2 ppm may cause mottled enamel in teeth when used by children acquiring permanent teeth; in smaller amounts, however, fluoride helps prevent dental cavities. Elemental fluorine has been studied as a rocket propellant as it has an exceptionally high specific impulse value. One hypothesis says that fluorine can be substituted for hydrogen wherever it occurs in organic compounds, which could lead to an astronomical number of new fluorine compounds. Compounds of fluorine with rare gases have now been confirmed in fluorides of xenon, radon, and krypton. Elemental fluorine and the fluoride ion are highly toxic. The free element has a characteristic pungent odor, detectable in concentrations as low as 20 ppb, which is below the safe working level. The recommended maximum allowable concentration for a daily 8-hour time-weighted exposure is 1 ppm. Safe handling techniques enable the transport liquid fluorine by the ton.